Last week was the official start of spring and what better way to celebrate than to make a dish full of fresh spring vegetables. Granted the temperatures are still a little chilly and my yard is a dreary mess from the long winter but making this risotto gives me hope. The brightness of the asparagus and spinach remind me that soon the sun will be shining more and (maybe) my lawn will be green again. 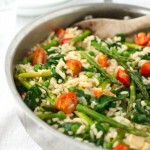 So, throw open the curtains, let the sun shine in, invite spring into your kitchen and make this risotto soon. In a large sauté pan or dutch oven, heat the oil over medium heat. Add the onions, salt, and pepper, and sauté until onions are soft, about 5 minutes. Add the rice and cook, stirring until grains are evenly coated with oil and are translucent at the tips, 2-3 minutes. Add the wine and stir until it is completely absorbed. Slowly add 1 cup of the hot broth to the rice. Keep the heat under the rice so that the broth is at a low simmer once it is added to the rice. Stir until broth is almost completely absorbed. Continue to add broth to the rice, 1/2 cup at a time, stirring constantly, reserving 1-2 cups of broth. When the rice is almost tender and looks creamy, after about 20 minutes, stir in the frozen peas. Then add the spinach and 1/2 cup broth, and stir. When the spinach is wilted, add the asparagus, tomatoes and another 1/2 cup of broth. Cook, stirring occasionally, until the asparagus, peas, and tomatoes are heated through and the vegetables and rice are just tender, 2 to 3 minutes more. Add more broth if risotto is not as creamy as you would like. You may find that you do not need all of the broth or that you need more. Remove the risotto from the heat and stir in the Parmesan cheese. Season with salt and pepper and serve hot. I like risotto that is extra creamy so I tend to use more broth. You may find that you only need 6 cups of broth rather than the full 8 cups. When you have added almost all the broth, taste it and decide whether you want to add more broth or not.